No homeowner ever plans for fire damage at his or her home or property. Confusion, stress and feelings of being overwhelmed are all very common and unfortunate byproducts of fire damage at your home. That’s why it’s so important to have a diligent and caring public adjuster by your side to guide you through this terrible crisis in a timely manner so you and your family can get on with your lives. Unfortunately, there is no such thing as a “small fire.” In most cases, even if the fire can be contained or extinguished quickly, the smoke and soot damage that can occur will still require your entire property to be remediated. Most fire and smoke damage is also accompanied by severe water damage from firefighting efforts, which can lead to an entirely new group of problems that many homeowners are too distraught to even think of. Many times the insurance companies do not inspect behind the walls to see what damage is lurking, leaving homeowners with an unfair assessment and settlement of their loss. DO NOT LET THIS HAPPEN TO YOU. 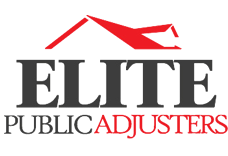 Elite Public Adjusters will work with the necessary remediation experts to be sure that no damage is left unfounded and that all repairs required are addressed in your insurance settlement scope in a timely manner.